It’s cold outside. So why not stay in and watch a Blu-ray? Or maybe digital streaming is more your bag? Whatever your pleasure, I’ve got copies of The Grinch to give away! That’s right, last year’s animated film, with Benedict Cumberbatch voicing the Grinch. Plus, there’s three shorts added, including two brand new Minion adventures! So what are you waiting for? Let’s go! 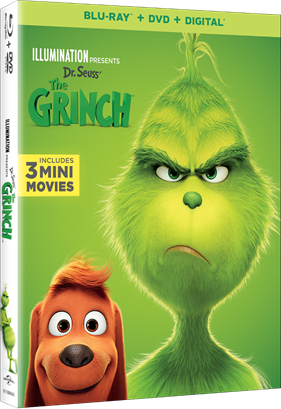 What: Ten winners will receive copies of The Grinch Blu-ray/Digital/DVD combo pack! Why: My heart grew three sizes today. How: It’s email time! Ship me a message at editor@atomicfangirl.com with the subject line “Are YOU A Mean One?”, and then put your name, mailing address and answer to that question in the body of the email. YOU HAVE UNTIL TUESDAY, JANUARY 22ND AT NOON TO ENTER. ONLY WINNERS WILL BE NOTIFIED. OPEN TO FOLKS IN THE CONTINENTAL USofA.